Assistive Speech + Language Learning for non-verbal Children. The Assistive Speech App that has everyone talking! Jump-start your child's speech and language today with the top-rated assistive communication AND language teaching solution (AAC) for children with non-verbal autism, apraxia, down syndrome, and developmentally delayed speech and language. AACORN is a more affordable and engaging alternative to traditional AAC apps and devices. It is an evidence-based solution that has helped thousands of children and their families - many of whom struggled for years with complicated and expensive speech-generating apps and devices designed for adults. AACORN's unique focus on BOTH speech and language development has seen AACORN recommended by Apple and embraced by over 20,000 families, schools and speech and language organisations. AACORN AAC for iPad goes beyond the 'buttons that speak' approach employed by other assistive apps and devices. Instead of your child needing to hunt in and out of folders looking for individual words AACORN offers an innovative easier to use design that children of ALL AGES and COGNITIVE ABILITIES take to like a duck to water. Your child makes a single word choice and aacorn finds and presents additional words automatically. Just like predictive text but with word pictures! As can be seen in the attached video the difference is amazing, allowing even the youngest or most developmentally delayed child to dramatically improve their language and vocabulary. 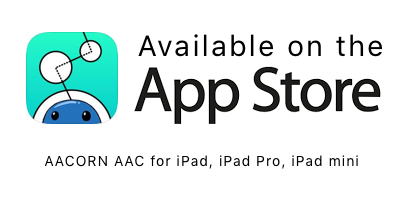 AACORN is featured by Apple in their 'Special Education' and 'Accessibility' collections of recommended apps that empower and is available today on the AppStore for iPad for far less than the cost of traditional speech-generating apps and devices! 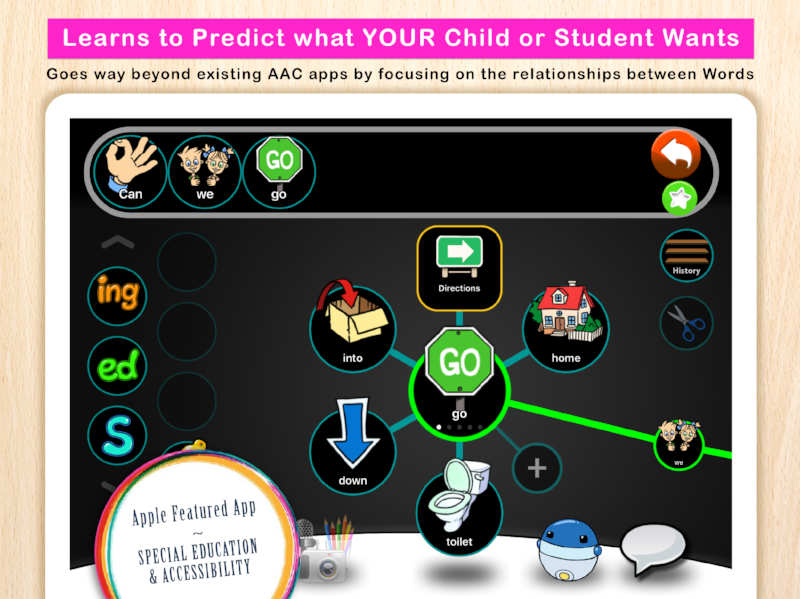 AAACORN AAC is so much more than another assistive communication (AAC) app. 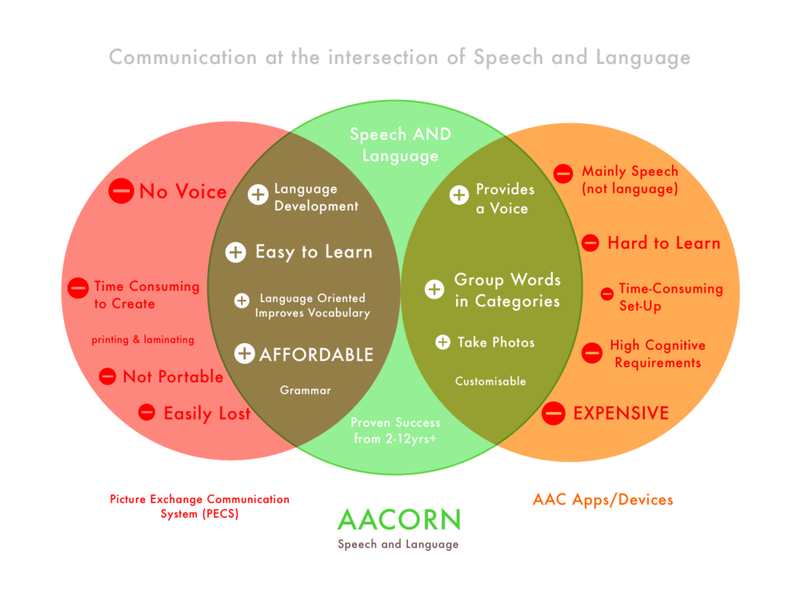 AAACORN's innovative design goes beyond speaking words and emphasises LANGUAGE LEARNING. The unique visual ‘Word Tree’ shows the connections and relationships between words, which is critical to helping to understand meaning and develop language understanding. Your child makes a choice and new branches with suggestions for new words present themselves AUTOMATICALLY as your child needs them. No other app does this! AACORN is designed for pre-literate users irrespective of age or cognitive ability. Reducing the need to ‘hunt and peck’ for words hidden in grids or folders! No requirement to be able to read or spell! No need for a child to have an exceptional memory to find words, and no waiting till they 'are ready' for an adult AAC. The difference needs to be seen to be believed, but is best illustrated by the following videos. Four awesome young communicators after just a few days using AACORN. Here are just a few of the lovely reviews from real families, reporting on their very real success using the app! That's not to say it isn't real work - it is - but for many of our AACORN families it has bought new hope, sometimes after YEARS of trying other apps/devices. Highly Recommended by Bridging Apps (Easter Seals). Read the full review here. Whether you are new to the world of assistive communication apps and devices, or you've been struggling with an AAC app or device for many years, there are a lot of good reasons to consider an alternate approach. It is a big decision, so we've boiled down the facts you need to know to help you make an educated decision. Give a young child a copy of Windows 3.1 and ask them to find some files - crazy right? Yet that's almost the challenge confronting most AAC users. By hiding words in folders and sub-folders it's not only hard to find the words, very often kids don't know what they should be looking for! AACORN goes a long way to solving this by learning to predict what a child is wanting to say and presenting the most likely options automatically! It can do this because we monitor and record HOW they use the app and can make suggestions over time based on the frequency with which they say certain words and phrases. AAC's that rely on a grid of folders layout ignore the fact that many kiddos who struggle with speech and language also have difficulty with recall and understanding meaning. AACorn works because it's branching pathway design visually shows the 'relationships' between words. Teaching language through word association at the same time as providing assistive speech is perhaps AACorn's most powerful and unique feature! AACORN was the first AAC designed and built specifically for the iPad (not ported or adapted from Windows/Mac) and the difference shows. Kids immediately get how to use it and find it a LOT easier to learn. AACORN is also the only AAC app with fully narrated interactive step by step lessons. We designed AACORN to grow wither your child, and because AACORN is native to the iPad it makes full use of ALL the powerful features built-in. Create new words, add photos, record audio, even draw pictures right from within AACORN. No Internet required, no hidden costs. In a short few years AACORN has been embraced by more than 10,000 families, SLP's and Educators. Just look at the reviews, AACORN can and does make a difference! Traditional AAC's with their grid and folder interface were originally designed for adults and require a level of cognitive ability that means you often hear an AAC 'expert' say he/she is not yet 'ready' for an AAC. This is why we made AACORN - a child is never not ready we just need better more appropriate tools! :) AACorn is used by children from as young as 2years! It's never too soon to start learning language. We charge less, MUCH less, than any of the big guys, because we care and because we can. By pricing AACORN at around half the price of our competition we're able to help more families, it's really that simple. We're parents first, and to us every child matters! Should you run into issues or have questions we're always happy to do whatever it takes to address your concerns as quickly as possible. Whether it's via email support@aacorn.co or the LIVEChat built into the app, or Facebook messaging, or the aacorn user group, or phone, help is never far away! There's no more discerning organization when it comes to Education than Apple. So we were honored when Apple management chose AACORN for inclusion in their very exclusive collections of recommended "Special Education' and 'Accessibility' Apps that Empower!